SouthWest Transit. You’ll love the way we move you. ECO-FRIENDLY • SMART • COMFORTABLE • EASY Award-winning transit agency for Carver, Chaska, Chanhassen and Eden Prairie. Express bus service Monday through Friday to downtown Minneapolis and the University of Minnesota. BURN.BUILD.BOOST. We know what it takes to get our members real ﬁtness results. Our 10-week proven program combines high-intensity cardio kickboxing with dynamic strength training and nutrition coaching to burn fat, build lean muscle and boost conﬁdence and energy. In 10 weeks you’ll look and feel like a brand new you! 2016 - 2017 Big Fish- 2017 Lifestyle GuideGuide 2016 Lifestyle Managing Editor: Richard Crawford \ Director of Operations: Laurie Hartmann Published by: Southwest News Media \ Editorial Content: Karla Wennerstrom Cover Design: Nicole Bullock \ Editorial Design: Barbara Tieben \ Advertising: Nancy Etzel Special thanks to the city of Eden Prairie and Eden Prairie School District for their contributions. Every effort has been made to provide an accurate directory, but if errors have occurred please let us know about them. Published by Eden Prairie News, 1001 Twelve Oaks Ctr., #1017, Wayzata, MN 55391. Copyright 2016-2017. Printed in the U.S.A. For additional information or to submit corrections, call 952-445-3333 or send an email to dcrawford@swpub.com. Cover photo by: Patty Dexter Eden Prairie takes pride in its parks. Developing athletes from novice to national levels since 1979—including three Olympic Trials qualiﬁers in 2012—and home of more than 27 Minnesota state team championships. • Bring a swimsuit and towel (goggles optional). Coaches will evaluate swimmers for group placement on the team. Plan for about half an hour, including a few minutes for swimming and a brief introduction to team staﬀ. • Team Foxjet coaches and parents will be available to answer questions. Make friends and learn the FUNdamentals of competitive swimming in a relaxed atmosphere. #1 OfďŹ ce Selling Eden Prairie Homes! Meet our awesome Eden Prairie Team! Coldwell Banker agents know the value of personal relationships. They’ll be with you every step of the way. Buying or Selling call one of these results-driven professionals to help you! 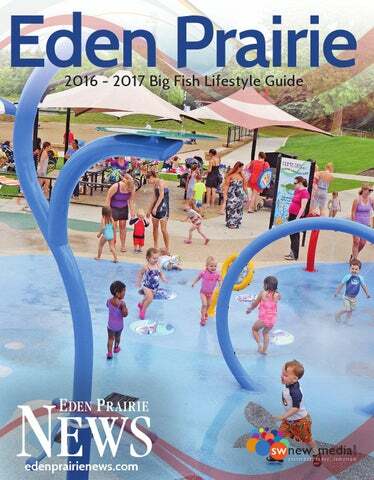 elcome to the 2016-2017 Eden Prairie Lifestyle Guide. What makes Eden Prairie such a welcoming community? For this year’s guide we asked for your advice and called upon a random sampling of Eden Prairie residents to tell us what they love about living here. Throughout our 2016-17 Eden Prairie Lifestyle Guide, you’ll see what they enjoy about the city, the community, the businesses and all the other amenities that make Eden Prairie not just where they live but what makes it their home. The Lifestyle Guide is a compilation of important information — a single source for lists of services, names, telephone numbers and e-mail addresses. Keep it handy; use it often. Our apologies in advance for omissions or for changes that occur after publication. Please notify us of information that needs to be updated so it can be kept current throughout the year. If you would like additional copies of this publication, call our Circulation Department at 952-345-6682. Send information for the Lifestyle Guide to Amanda McKnight at amcknight@swpub.com. The city of Eden Prairie has been recognized as a great place to work and raise a family for many years, and has been listed as one of Money Magazine’s “Best Places to Live” in America since 2006 — this year reaching No. 2 on the list! In 2010, Eden Prairie was named the No. 1 Best Place to Live in America. In 2012, Eden Prairie was named the No. 3 Best Place to live in America. A community of more than 60,000 people, Eden Prairie is home to more than 2,200 businesses. Eden Prairie also offers attractive residential neighborhoods, affordable housing options, more than 170 miles of multi-use trails and 2,250 acres of park land. Fine restaurants and shopping are plentiful in Eden Prairie. Combined with excellent schools and a strong sense of community, Eden Prairie is truly a great place to Live, Work and Dream. den Prairie offers a wide variety of attractions for every age of resident. When asked for their favorite, most have trouble narrowing it down to one, but they can usually agree that it’s one of the parks or trails. “I think the park system is really one of the things that we have to be most proud of,” said Grant Henry, who has lived in Eden Prairie since 1995. “Every park has different amenities and they’re clean and they’re well kept,” he said. “We’ve really been impressed with the park system.” Foundation for Eden Prairie Schools President Sarah Cheesman said that she enjoys Round Lake Park. “I love that they’ve upgraded the beach and kids’ play area,” she said. “It’s so much fun to see families over there enjoying that area.” Miller Park and Round Lake Park splash pads are popular with young families, teens enjoy disc golf courses at several parks and the skate park at Round Lake Park and the recent completion of the Eden Prairie Aquatics Center is a hit as well, with the new waterslide, hot tub and zero-depth play area unveiled this year. You’ll find events in the community on any day of the week, including major events like the Lions Club’s Schooner Days in June, the Eden Prairie Noon Rotary’s Rib Fest and Jazz on the Prairie, the Fourth of July Hometown Celebration, Wings of the North’s AirExpo and more. Residents gather at the Eden Prairie Art Center, Veterans Memorial, Staring Lake Outdoor Center and Observatory, and enjoy performances at the Staring Lake Amphitheatre, Eden Prairie High School Performing Arts Center and Riley-Jacques Barn. Purgatory Creek Park recently became a destination for Pokemon Go players. “For folks looking for entertainment, you don’t have to go far to find it,” said resident Doug Loon. You can find a free event on most nights of the week, especially during the city’s summer entertainment series. Summer in Bloom. Gardens in bloom. Plus outdoor exhibits, music, family fun. The Best Fall Color. Amazing scarecrows. Pumpkin Palooza. Events and fun outdoors. AppleHouse open. Flying Cloud Fields 15219 Pioneer Tr. On land owned by the Metropolitan Airports Commission, this community youth athletic complex has soccer fields, youth softball fields, a fenced ballfield and a concession stand/storage facility. Miller Park 8208 Eden Prairie Rd. Youth baseball fields, youth softball fields, a lighted regulation baseball field, five soccer fields, two tennis courts, a basketball court, a barrier-free play structure, an interactive splash pad, a picnic area, bike trails, hiking trails and parking for more than 900 vehicles; it has a fishing pier and a boat ramp onto Mitchell Lake (boats are limited to 10-horsepower motors or less). Purgatory Creek Park 13001 Technology Dr. Gardens, a picnic pavillion, wetland, walking trails, a fountain and the Eden Prairie Veterans Memorial are highlights of this area. Riley Lake Park 9180 Riley Lake Rd. Swimming beach, public boat ramp and fishing pier, as well as a fencedin childrenâ&#x20AC;&#x2122;s play area and a park shelter. Additional facilities include two ballfields, two tennis courts, a basketball court, and four sand volleyball courts. The historic RileyJacques Farm is located at this park. The barn has been restored and is available for public rental. Round Lake Park 16691 Valley View Rd. Enjoy a unique outing and memorable fun for all ages. Celebrating our 44th year! • Featured in USA Today’s Top Ten U-Pick Orchards in America. • Premiere wedding venue, hosting over 180 weddings each year. • Spacious 300 acre site ideal for outdoor events (wagon rides, BBQ, Bon ﬁres, woodland trails). Enjoy our apple bakery, restaurant, shops, and event seating for 300. • NEW IN 2016! Minnesota Harvest Cidery & Tasting Room. ATTRACTIONS structure, boat ramp onto Red Rock Lake and a picnic area. Boats are restricted to 10 horsepower or less Rice Marsh Lake Park 8266 Erin Bay Tennis court, play structure, basketball court and a ball field. Rustic Hills Park 17465 Rustic Hills Dr. Adjacent to Edenbrook Conservation Area. A tennis court, basketball court, a sand volleyball court, play structure, ballfield and picnic area, and nature trail connecting to Edenbrook Conservation Area. Smetana Lake Park 7620 Smetana Lane On the shores of Smetana Lake, this park has walking trails around the lake, covered picnic area, play structure, boat ramp and fish pier. Willow Park 7402 Butterscotch Rd. Baseball field, basketball court, tennis court and play structure. Wyndham Knoll Park 6525 Dell Rd. Ballfield, a soccer field, two tennis courts and a play structure. REGIONAL PARKS Three Rivers Park District 763-559-9000 www.threeriversparks.org Bryant Lake Regional Park 6800 Rowland Rd., Eden Prairie 763-694-7764 Bryant Lake Regional Park, located south of Highway 62 and west of Shady Oak Road on Rowland Road, is operated by Three Rivers Park District. Facilities include a threeseason concession plaza, threeseason pavilion, paved boat launch, fishing pier, swimming beach, boat rental building, 2.2-mile turf hiking trail, 1-mile paved bike/hike trail, general picnic area, disc golf course, dog park and creative play area. mental education. The Staring Lake Observatory is located here. Visit www.edenpr.org/outdoorcenter. RECREATION Eden Prairie Community Center 16700 Valley View Rd 952-949-8470 Located west of the intersection of Eden Prairie Road and Valley View Road, Eden Prairie Community Center is equipped with an expanded fitness area and group fitness studio, indoor swimming pool, three indoor skating rinks, a child care facility, play structure, expanded locker rooms, a family locker room, two racquetball courts, gymnasium, meeting facilities, a cafeâ&#x20AC;&#x2122; and lounge area. Memberships are available at resident and nonresident rates. Visit www. edenprairie.org/communitycenter for more information. WATER SLIDE Oak Point Pool 13400 Staring Lake Pkwy 952-949-8470 Two pools, a 141-foot waterslide. LAKES There are 17 lakes within Eden Prairie, and they are an important feature for everything from recreational to wildlife habitat uses. Lakes include Anderson, Birch Island, Bryant, Duck, Eden, Grass, Idlewild, McCoy, Mitchell, Neill, Red Rock, Rice, Rice Marsh, Riley, Round, Smetana and Staring Lakes. Riley Lake Park Beach 9180 Riley Lake Road Enjoy a fabulous beach, great swimming, a boat launch, picnic tables, grills and sand volleyball. Lifeguards are on duty during the summer months. Round Lake Park Beach 16691 Valley View Road Swim in the lake, enjoy a picnic, build a sandcastle or relax in the sun. A large playground, park pavilion, tennis courts, baseball fields and large picnic area is also available. Lifeguards are on duty during the summer months. Over 250 teas available by the pot or by the pound 2016 Best Customer Service Award 2015 Best Tea Business Award 561 Prairie Center Dr.
— Foundation for Eden Prairie Schools Executive Director Sarah Cheesman A.M. Rotary Club Vino Classico (beer and wine tastings) are favorites for the town’s foodies. “I think those are all great opportunities to support the community,” Cheesman said. “I love that when you go to those events, you always see people you know. Events are a great way to connect with people.” Eden Prairie also has two natural springs where you’ll find visitors lining up to fill their water bottles and gallon jugs. Fredrick-Miller Spring is at 9995 Spring Road and the Richard T. Anderson Conservation Area Spring is at 18700 Flying Cloud Drive. — Minnesota Chamber President Doug Loon, speaking of the Eden Prairie Fire Department Center, 8080 Mitchell Road, where residents can obtain a building permit, learn about ordinances, attend meetings and visit a museum of Eden Prairie history. The city’s Police Department is headquartered here and the Fire Department is headquartered across the parking lot at Fire Station No. 1. For more information, call 952-949-8300 or visit www.edenprairie.org. You’ll find staff blogs, meeting videos, news and events calendars at www.edenprairie.org. Residents can visit https:// eden-prairie.granicusideas.com/ to join a discussion at “City Connect” or download the “See Click Fix” app to report issues like potholes. For emergencies, call 911; for non-emergencies, call 952949-6200. For license renewals, visit www.hennepin.us or call 612-3483000 for information. For passport information, visit http:// iafdb.travel.state.gov or call 1-877-487-2778. Eden Prairie’s library, which has the highest circulation of any Hennepin County Library, is at 565 Prairie Center Drive. Call 612-543-6275 or visit www.hclib.org for more information. EDEN PRAIRIE CITY COUNCIL Eden Prairie is a “Plan B” city. The council-manager plan of government means all policy and legislative decisions are the responsibility of the elected City Council. Eden Prairie residents are represented by a mayor and four council members. The mayor serves four-year terms and the council members serve four-year “at-large” staggered terms. City elections are held in even-numbered years with the general election in November. The council delegates all administrative duties to the city manager. The city manager is accountable to the council for the administration of city business in accordance with council decisions. The city manager oversees the day-to-day administrative duties and hires city staff. door activity doesn’t stop. The city works hard to clear snow from trails so runners and bikers can continue to use them. There are also several outdoor ice rinks maintained throughout the season, as well as a groomed cross-country ski trail and giant sledding hill at Staring Lake Park. The Eden Prairie Community Center is an action-packed gathering place featuring three ice arenas, a gymnasium and stateof-the-art fitness center, and the newly expanded aquatics center. Opportunities for physical activity abound with the generous offering of group fitness classes and youth programs, and with the addition of a climbing wall and water slide, aquatics at the Community Center has been elevated to a new level. Personally, I love that I can get on my bike and ride the miles of trails for exercise or just to meet friends for coffee at the Dunn Bros located in one of the city’s historic properties, the Smith-Douglas-More House. I also enjoy scenic strolls around Staring Lake, which frequently lead me to an evening of music at the outdoor amphitheater or an astronomy event at the Staring Lake Observatory. The possibilities for living an active lifestyle are truly endless in Eden Prairie, which for me, makes life great in this outstanding community I’m proud to call home. To learn more about living in Eden Prairie, visit edenprairie. org. Tyra-Lukens is the mayor of Eden Prairie. cessation of the precipitation. For more information, call 952-9498300. Storage Containers: Solid Waste and Recycling Storage containers for Single Family Dwellings, Multiple Family Dwellings or Commercial Establishments must be stored at least 20 feet from the property line. Storage containers stored within a front yard must be screened from the public street with an opaque fence or coniferous landscape material. Storage containers for Solid Waste, Recyclable Materials or Yard Waste may be set curbside 24 hours prior to the scheduled pickup. The storage containers must be removed from curbside within 24 hours after the scheduled pickup. Junk Cars, Furniture, Household Furnishings & Appliances It is unlawful to park or store any unlicensed, unregistered or inoperable motor vehicle, furniture, household furnishings or appliances, or parts or components thereof on any property, public or private, unless housed within a building. Visit edenprairie.org for more information. HENNEPIN COUNTY 612-348-3000 Hennepin County: Mission, vision and goals The mission of Hennepin County is to enhance the health, safety and quality of life of residents and communities in a respectful, efficient and fiscally responsible way. Hennepin County Vision: We envision a future where residents are healthy and successful and where our communities are safe and vibrant. We will strive to meet and exceed expectations by engaging people and communities in developing innovative solutions to challenges. We will be a diverse, learning organization. We will partner with others to enhance the quality of life in Hennepin County and the region. Hennepin County goals: People are healthy, have access to quality health care and live in a clean environment. People are safe from harm through prevention, early intervention and treatment services, and through enhanced public safety. People achieve success with the support of essential services, have access to affordable housing and opportunities for life-long learning. People are assured equal protection of the laws through an adversarial and respectful system designed to assure fairness and reliability in the ascertainment of liability, guilt and innocence. People and goods move easily and safely throughout the county and the region, via an integrated system of transportation. HENNEPIN COUNTY BOARD The Hennepin County Board meets most Tuesdays in the board room of the Hennepin County Government Center at 1:30 p.m. Alternate Tuesdays, board committees meet. Commissioners serve four-year terms. Board and committee meetings are broadcast live on Cable Channel 6, and rebroadcast Friday nights at 8 p.m. For more information on Hennepin County government, go online at www.hennepin.us. Vietnamese and other languages are available. The Eden Prairie Library has more than 80 computer workstations, free Wi-Fi during open hours and a computer lab with word processing software. Storytimes and other free programs that support family literacy and learning are offered regularly for children, teens and adults. Hennepin County Library System Renewals 612-543-8811 www.hclib.org “Ask Us” information service at 612-543-KNOW, or text “hclib” to 66746 or www.hclib.org/askus The Hennepin County Library system is affiliated with the Metropolitan Library Service Agency (MELSA), which allows Hennepin County Library card holders access to other libraries in the seven county metropolitan area. All of these services, except driver’s exams, can be provided at the Ridgedale and Southdale Service Centers. Hours vary by center. For information, visit www.hennepin.us. viduals and families. The council serves a region encompassing 189 cities and townships and a population of 2.85 million. It is divided into 16 districts. The governor appoints a representative for each, as well as the council chairperson. SouthWest Transit 13500 Technology Dr., Eden Prairie, MN 55344 952-949-2BUS (2287) www.swtransit.org SouthWest Transit operates under a joint powers agreement of the cities of Chaska, Chanhassen and Eden Prairie. Bus transportation is provided to downtown Minneapolis and the University of Minnesota, Monday-Friday, from the following Park-and-Ride locations: Chanhassen Transit Station, Chanhassen; SouthWest Village, Chanhassen; Walnut Park and Ride, Chaska; Cloverfield Park and Ride, Chaska; SouthWest Station, Eden Prairie; Preserve Village Mall, Eden Prairie; and Shady Oak Road, Eden Prairie. SouthWest Transit 13500 Technology Dr., Eden Prairie, MN 55344 952-949-2BUS (2287) www.swtransit.org SouthWest Transit operates under a joint powers agreement of the cities of Chaska, Chanhassen and Eden Prairie. Bus transportation is provided to downtown Minneapolis and the University of Minnesota, MondayFriday, from the following Parkand-Ride locations: Chanhassen Transit Station, Chanhassen; SouthWest Village, Chanhassen; Walnut Park and Ride, Chaska; Cloverfield Park and Ride, Chaska; SouthWest Station, Eden Prairie; Preserve Village Mall, Eden Prairie; and Shady Oak Road, Eden Prairie. WATER & SEWER Water Bills & City Sewer 952-949-8382 WASTE DISPOSAL Eden Prairie refuse haulers are required to collect recyclables, including newsprint, glass, cardboard and plastics. Some choose to collect additional materials. Eden Prairie refuse haulers may provide additional services ; contact your hauler for information. You must be registered to vote. If you have changed your name or address since registering, you must complete a new registration application. By registering prior to Election Day, your name and address will appear on the polling place roster. An individual may register any time before the 20th day preceding any election, on Election Day at the polling locations or when submitting an absentee ballot. Registration applications are available at city and township offices, libraries and the county auditor’s office. If you changed your address, you may register to vote when you change your driver’s license. To register on Election Day, you must have a State of Minnesota recognized identification showing your present address on it. For detailed local election information, visit the City of Eden Prairie Website at www.edenprairie.org. The Riley Purgatory Bluff Creek Watershed District has grants available for community members who want to build clean water projects. Who can apply? Home-owners, associations (home/lake), businesses. — Resident Tori Hill Having seen the options available for seniors in the community, Loon said, “I’ve been very impressed with the sophistication, the quality and the convenience of those senior facilities.” Eden Prairie offers a wealth of health-care options, including clinics, urgent care and emergency room facilities as well as dental, optometry and chiropractic providers. LOOKING FOR A NEW HEALTHCARE PROVIDER IN EDEN PRAIRIE? Fairview Clinics is an easy choice. Patients and their families know they can count on Fairview at any stage of life. From preventive care, to illness and injury, to family planning and managing complex conditions, our team is here for you. With same-day appointments, we make it easy to receive care. Open 7 a.m. - 7 p.m., Monday - Thursday, and 5 p.m. on Fridays. We also offer diabetes education, cardiology, nutrition and counseling services. Creating healthy RADIANT smiles for life. We have been loving and caring for elderly ladies living in our Eden Prairie home for over 20 years. Please call if you need help finding a special home for your loved one. On Prairie Center Drive across from Lunds & Byerlys. full orthodontic treatment. New patients only. Cannot be combined with any other oﬀer. Judson Heitner D.D.S. Benjamin Fenger D.D.S. Benjamin Fenger D.D.S. Jeffrey Moos D.D.S. Jeffrey Moos Jennifer DyllaD.D.S. D.D.S. Jennifer Bertrand Erik Davis D.D.S. D.D.S. Brace Yourself for Success School Shuttle to 30+ local schools! Four generations of Minnesotans can trace their beautiful, healthy smiles to the team at Ovation Orthodontics. We love that because everywhere we go we get to see the smiling faces of our patients – our friends.With ﬁve ofﬁces, that’s a lot of friends! y the numbers, Eden Prairie has more than 4,500 acres of open-space wetlands, more than 1,000 acres of active-use parkland, nearly 200 miles of sidewalks and trails, more than 100 ponds and 17 lakes. There are conservation areas, historic farmsteads, ball fields, playgrounds, an archery range, public beaches, fishing piers, skating rinks, community gardens, tennis courts, pickleball courts, in addition to facilities like the Eden Prairie Art Center and Senior Center. New this year are updated playgrounds at Hidden Ponds Park and Pheasant Woods Park and the second phase of the Eden Prairie Aquatics Center at the Eden Prairie Community Center, with a zero-depth pool, hot tub and water slide. A new play area at Staring Lake Park is set to feature an art and music theme, fitting in with the nearby Staring Lake Amphitheatre. Round Lake Park’s second phase continues with work on the ballfields and parking lots. Work could start this year on Cedar Hills Park, the last major park planned for the city. Making use of all the park facilities are a variety of organizations including clubs and athletic associations. “We have a nice variety of organizations where everybody can link in and volunteer,” said resident Tori Hill. Former Eden Prairie Community Foundation Board Chair Doug Loon said that group provided him a unique vantage point to assess the community’s services and volunteer organizations. “What I witnessed from that viewpoint was that we have a deeply caring community that gives back,” he said. That strengthens the fabric of the community and “demonstrates a willingness to give back and support the values of the community,” he said. — Former Eden Prairie Foundation Board Chair Doug Loon “That organization continues to grow and support other organizations while at the same time being a leader in bringing those organizations together to make sure services are provided and needs met,” Loon said. The new Miracle League field at Flying Cloud Fields along Pioneer Trail is open, giving children with disabilities a chance to participate on a baseball team. Residents enjoy hiking, pickleball, biking, paddleboarding, fishing, boating, swimming, geocaching, snowshoeing and more and visit the Eden Prairie Senior Center, Staring Lake Outdoor Center, Eden Prairie Library, Eden Prairie Art Center, Cummins-Phipps-Grill and Riley-Jacques homesteads and Smith-Douglas-More Dunn Bros.
ART OFFERINGS Youth and Family Eden Prairie Parks and Recreation offers classes and activities in the arts, music and movement, drama and theater for infants through age 12. These programs are offered during the day, after school and during school breaks. Specific programs are included in the Parks and Recreation Program Guide, which is published in August, November and March. Call 952-949-8470 to receive a mailed copy of the current brochure or go to edenprairie. org/parksbrochure for an online version. Eden Prairie’s annual Arts in the Park event drew a crowd to Purgatory Creek Park. (Photo by Karla Wennerstrom) Band and the Jazz on the Prairie Big Band. The band is also home to the Prairie Schooners (Dixieland). Open to adults who live or work in Eden Prairie, all instrumentalists are needed and residents are invited to join the group at any rehearsal (Central Middle School in Eden Prairie, Thursdays at 7 p.m.). For more information, contact the city of Eden Prairie at 952-9498455. Visit edenprairie.org to find a list of upcoming concerts. schools. The city has even been honored for being innovative in its snow removal. Eden Prairie is served by the Eden Prairie School District (272), Minnetonka Public Schools, and private schools including the International School of Minnesota. Eden Prairie is also home to Hennepin Technical College, ITT Technical Institute and Rasmussen College. “The school system is top notch,” says Eden Prairie resident Grant Henry. “Both of my kids went all the way through Eden Prairie schools from preschool to high school. I can’t say enough good things about the school system. That’s really what attracted us in the first place and kept us here. “We came here to Eden Prairie to find a place to settle down and raise a family and we got what we were hoping for,” Henry said. quests and gifts of property, such as securities and real estate. For special gifts, it works with donors to assure that gifts or gift proceeds are applied in accordance with the donor’s wishes. We make math make sense. CHRISTIAN WORLDVIEW EDUCATION BEAUTIFUL CHASKA CAMPUS COLLEGE PREP ACADEMICS Call us $50today Off for Assessment a free trial! TO LEARN MORE OR SCHEDULE A VISIT CONTACT US AT 952-556-0040 OR SWCHS.ORG. Preschool teacher Jennifer Wartick reads “Deep Sea Dive” by Salina Yoon to students during Eden Prairie Community Education’s nonschool day on April 1. (Photo by Patty Dexter) fine arts, computer coding, digital citizenship, STEM and physical education are part of every child’s elementary education. Minnetonka High School offers accelerated courses, including pre-engineering and architectural design, as well as dozens of Advanced Placement (AP) and International Baccalaureate (IB) Diploma courses and VANTAGE, Minnetonka’s Advanced Professional Studies program. LIVING for education, trips, card groups, musical performances and other social activities for seniors. The center also offers health screening, a foot care clinic and a transportation program. to homebound, disabled or elderly individuals in Eden Prairie. In addition to providing the meals, the daily visits also provide a check on clients’ safety. Winslow Monument Service (WMS), can help you make heartfelt and important decisions about yourself and loved ones. You can be reassured that WMS is Reliable, Experienced, Honorable and Trustworthy. We are a family-owned business that has been in operations for over 25 years! We specialize in Memorials (headstones, gravestones, tombstones, monuments) in the greater Minneapolis / St. Paul and surrounding areas. Established Over 150 Years Ago… We are proud to be an active part of our community. Funeral Chapels, Cemeteries and Cremation Services For over 150 years, Washburn-McReavy has served the metropolitan communities with quality, fairly priced funeral and cremation services. We are proud to continue this tradition at our Eden Prairie Chapel. Traditional . . . . . . . . . . 5:00 PM Called to care. Sent to serve. serving the community. strengthening families. The 1924 Consolidated School (today the School District’s Administrative Services Center) was for many years the town’s elementary and high school. A new Eden Prairie High School was built in 1961 which today is Central Middle School. The Wye Cafe at the Flying Red Horse Mobil Station when it was still serving customers. One spot for socializing was Lookout Park, now on Flying Cloud Drive (and off limits to visitors). grapevine arbor 50 years ago and today we can do the same at their home on that same patio, now know as Dunn Brothers Coffee Shop at the Smith-DouglasMore House. The Riley-Jacques Barn and Homestead still grace the shores of Riley Lake. The land is public parkland and the barn is an event rental property and enjoyed by many during community summer celebrations. And on Pioneer Trail we have the Cummins-Phipps-Grill Homestead with events hosted by the Eden Prairie Historical Society, for instance Santa visits every December! Since mid-century Eden Prairie’s population and development have exploded, bringing profound changes to the face and pace of the area. It’s hard to see and reconnect with our agrarian roots but if you look carefully and use your imagination, you can most certainly find and feel some Eden Prairie history. Airport. Redevelopment is underway for businesses along the path of the proposed Southwest Light Rail Transit line. “I would almost consider Eden Prairie a one-stop shop,” said Minnesota Chamber President Doug Loon. “It’s got virtually everything you could ask for in terms of service and retail, to meet the needs of its citizens. “It provides a terrific balance between leisure activities, convenience to services and a large employment base that allows the community to stand out among others in the region and the state,” Loon said. CHAMBER OF COMMERCE Eden Prairie Chamber of Commerce 11455 Viking Drive, Suite 270, Eden Prairie, MN 55344 (952) 944-2830 http://epchamber.org LOCAL MEDIA Eden Prairie News Published Thursday. Delivered by mail. No matter the season we are here to help! For over 70 years we continue to provide homeowners, business owners, and congregations throughout the area with expert heating and air conditioning services. From designing and installing a brand new Lennox system to maintaining and repairing existing systems, our experienced technicians are here to help. airport. The proposed alignment would offer new development and an additional transportation options for area businesses to recruit and retain employees. In addition, the route would provide area residents a direct link to major events at Target Field, Target Center and the new Vikings stadium – U.S. Bank Stadium. Eden Prairie continues to draw new businesses, visitors and residents to its city. Eden Prairie has received countless accolades for places to live, a strong businesses community and great schools. Eden Prairie is growing and is stronger than ever, and we look forward to the positive changes and future success of our business community! Mulqueeny is president of the Eden Prairie Chamber of Commerce. HUMANE SOCIETY CARVER-SCOTT HUMANE SOCIETY The Carver-Scott Humane Society serves Carver and Scott counties as well as a portion of Hennepin County. The organization has a location in downtown Chaska but the majority of all abandoned pets are housed in foster care until permanent adoption. The humane society frequently hosts pet adoption days. At the new space in downtown Chaska at 210 Chestnut Street North, the organization houses up to 12 cats on site. For more information about the Carver-Scott Humane Society, call (952) 368-3553 or visit www.carverscotths.org. Those interested in volunteering can fill out an application online, call or stop by 210 Chestnut Street North in Chaska. Staring Lake Parkway is home to several animals that kids can visit. The center offers classes, workshops, trips and activities, including activities for scouting groups.